I have to say that I am crazy about breads. If you look through my blog at all you will find all kinds of breads that I have made and posted about, since I have started my blog. I have even graduated from using only white all-purpose flour to using wheat and rye. Today I have moved it up another notch, at least in my book. I have made naan. Before my blogging days if someone would have asked what I thought about naan, I would have had no idea what they were talking about. But now I have seen several recipes for this bread and was quite curious about it. 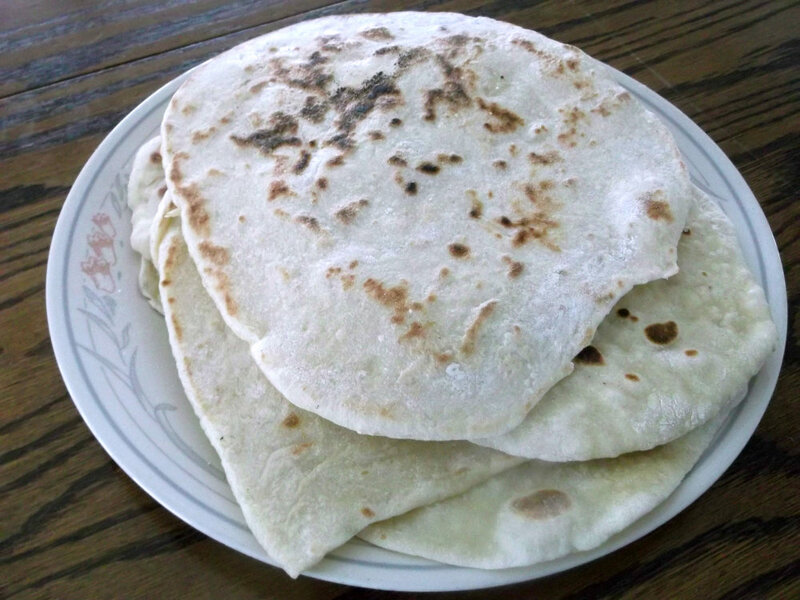 This past weekend I decided to make some spicy pork and I want the perfect bread to go with my meat, so I decided to try something new and that is when I decided to try naan for the first time. The bread was easy to make and turned out nice and soft. Perfect for the spicy pork that went with the meal. I will be posting the pork on my next post so I hope that you will stay tuned in for that. In a bowl, dissolve the dry yeast and 1 teaspoon of sugar with 3/4 cups water (about 100 degree F). Let it sit on the counter until it’s frothy, about 10 minutes. Meanwhile, sift the flour, salt, remaining teaspoon sugar, and baking powder into a large deep bowl. Once the yeast is froth, add the sour cream and the olive oil into the bowl and stir to combine. Pour the sour cream mixture into the dry ingredients and gently mix the ingredients together with a fork. When the dough is about to come together use your hands to mix. Knead dough until transforms into a soft slightly sticky and pliable dough. As soon as it gets to that point stop kneading. Cove the dough with plastic wrap or a damp tea towel and let set in a warm place for 2 to 4 hours. When the bread is ready to roll out divide the dough into six even pieces. Roll out on a lightly floured surface. Use a rolling pin to roll the dough into 8 to 9 inch circles and about 1/4 thick. Warm a skillet over high heat; make sure that you have a cover that will fit the skillet. Dampen your hands in a bowl of water and pick up one of your naans and flip flop it from hand to hand to dampen it. Gently lay it in the skillet and set the timer for a minute. The dough should start to bubble. After about a minute flip the naan over. 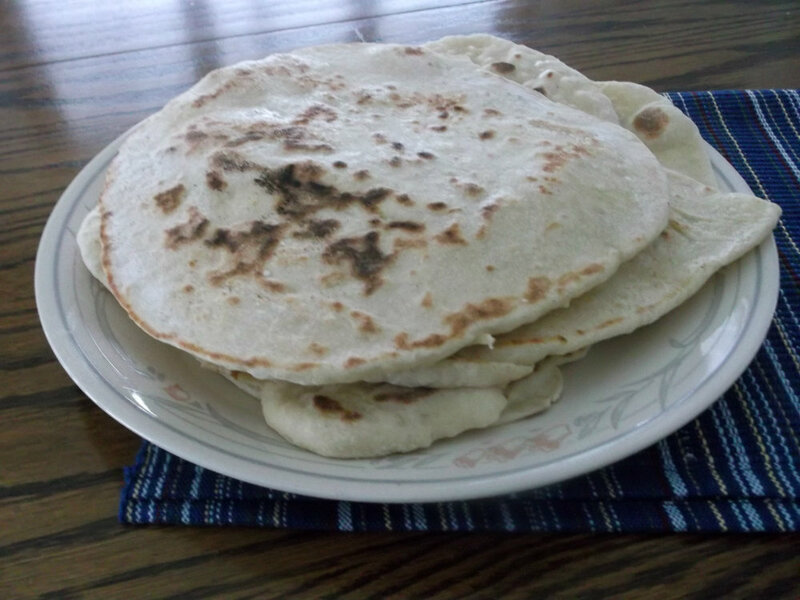 It should be blistered and somewhat blackened, but do not worry that is typical of traditional naan. Cover the skillet and continue cooking for another 30 seconds to a minute. Remove from skillet. The naan can be brushed with melted butter and sprinkled with sea salt at this time, this is optional. I love bread too. This naan looks fantastic. Hope you are having a lovely week Dawn! Yeast and I do not get along, but I just may try this anyway. Love naan and yours looks so good. I love naan! What fun to be able to make it at home! 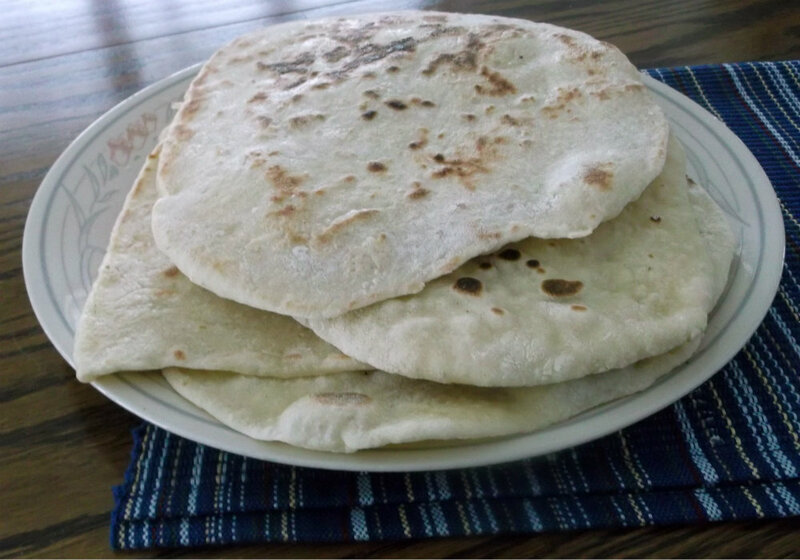 I love all Indian breads, but I think naan is my favorite. Really good job with this! You can buy it at the store, but homemade is so much better. Great job!